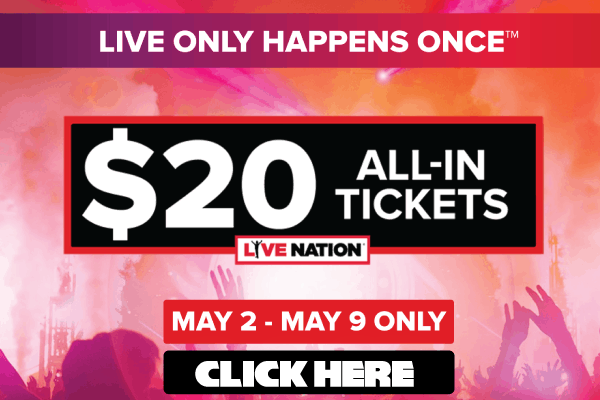 Summer concert season is just around the corner, and Live Nation is turning up the heat by offering fans concert tickets for just $20. The live entertainment company made more than one million tickets available starting 8 a.m. Monday, April 30, as part of its “Kickoff the Summer Ticket Promotion.” The sale will end midnight May 8. Offer valid 8 am local time on April 30 to 11:59 pm local time on May 8, 2018 on select shows, while supplies last. Click for participating dates & select $20 ticket. Ticket delivery, print at home fees not included. All ticket purchases are subject to the Purchase Policy. The tickets cover about 1,000 shows all over the county, featuring big name performers such as Dead & Company, Luke Bryan, Arcade Fire, David Blaine, Logic, The Smashing Pumpkins and more! Find more information or book tickets on the Kickoff the Summer Ticket Promotion website.